Bahujan Samaj Party (BSP) supremo and Uttar Pradesh chief minister (CM) Mayawati slammed Congress party leadership for shedding "crocodile tears" over the killing of Muslim youths in an "anti-terrorist" operation at Delhi's Batla house. "If the Congress leadership was truly sincere on the issue, why did it not concede the popular demand for an independent judicial probe into the encounter?" 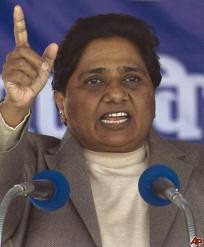 Mayawati asked at a huge election rally in this Uttar Pradesh district. She was referring to union law minister Salman Khurshid's claim that Congress president Sonia Gandhi almost burst into tears when she was shown pictures of the Batla House gunfight. “The Congress is enacting a drama on the Batla House case. It is trying to emotionally blackmail Muslims by telling them stories about how people cried on seeing pictures of encounter. If Congress was serious in providing relief to Muslims, it should have ordered judicial probe into the incident so that people could know the truth,” Mayawati said while addressing election meetings in Mirzapur and Sonebhadra on Saturday. The BSP supremo said if Congress’ intention were clear it should have implemented Sachar Committee report. "By ignoring the Sachar Committee report, the UPA Government has betrayed people. The Congress has always used Muslims as vote bank as a result of which this community has lagged behind in all spheres of life," she said and asked Muslims to beware of such tactics of the Congress.